Dada is one of the major movements and the most influential phenomena in 20th century art. The exhibition Dada Impulse will demonstrate the liveliness of the Dada attitude of defiance vis-a-vis existing artistic conventions since its inception and emergence during and immediately after World War I until its re-intensified manifestations between the 1950s and the 1970s. The exhibition is extremely cohesive, which is reflected in the selection of works from one of the biggest private avant-garde collections – the Egidio Marzona collection. The aim of the exhibition is to take a look at the legacy of Dada and Neo-Dada movements not only as the expression of revolution in art founded on novelty art strategies, rooted in specific social and economic contexts but also as a manifestation of the idea of art, which by intertwining seemingly contradictory narratives: performance and objectiveness, automatism and rationalism, destruction and construction may create a homogenous, holistic message. From the viewpoint of the curators, the diversity of means used by Dadaists and their lack of trust in traditional conventions of art are elements of a coherent, universalist creative attitude, in which anti-art, defiance, rebelliousness and constant distancing from the existing borders between art and non-art have become methods of artistic interventions under changing historic circumstances. DADA Impulse exhibition has been designed as an experiment: the image of Dada is constructed against the background of a concrete collection of artworks of the 20th century created by Egidio Marzona. Marzona Archive, built for more than 40 years, can be perceived as a sort of spectacular collage, the end result of the collector’s personal history, in which, besides traditionally understood, finished works of art there are equally important drafts, letters, notes, postcards, invitations, exhibition catalogues, newspapers and all sorts of archives and ephemera. Finally, the archives have become an impulse for constructing the order, „the image of the epoch” and, at the same time, the reflection of anarchist but also reformist attitude. 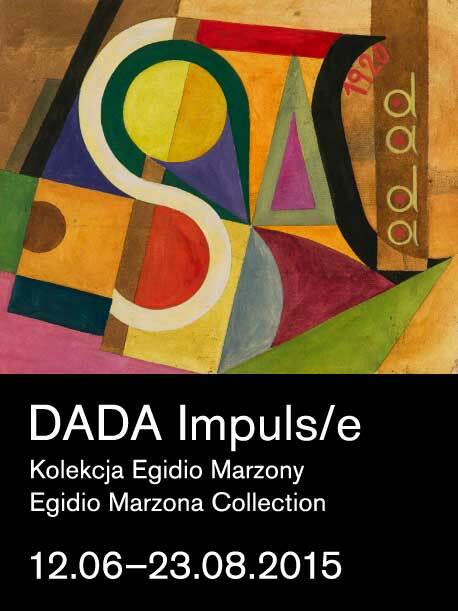 DADA Impulse is also an opportunity to reflect how Dada related aspects can explain the idea of collecting. The exhibition includes almost 300 works – objects, paintings, graphics, drawings, sculptures, prints and archival materials from the collection. Visitors will have the opportunity to see works by such eminent artists like Marcel Duchamp, Kurt Schwitters, Jean Arp, Sophie Taeuber-Arp, Man Ray, Max Ernst, Francis Picabia, Hans Richter, Marcel Broodthaers, Stephen Kaltenbach, Barry Flanagan, Bruce Nauman, Ray Johnson, Arman, Daniel Spoerri, Claes Oldenburg, Andy Warhol, and Richard Hamilton. For the first time the Polish audience will enjoy such a broad presentation of Dada accomplishments and will be introduced to many works and artists never exhibited in Poland before. Exhibition open until 23 August 2015. The exhibition will be accompanied by a Polish – English catalogue with essays discussing Dada and its impact on art after World War II written by Hubert van den Berg, Matthew Biro and Hall Foster, reprints of original texts by artists such as Theo van Deosburg and Claes Olenburg and the interview with the collector Egidio Marzona. The publication will also include more than 40 illustrated notes by Julia Connert, Paulina Kurc-Maj, Paweł Polit, and Anna Szyjkowska, who introduce major artworks shown at the exhibition.